Looking closely at the recent reform efforts in San Diego, this book explores the full range of critical issues pertaining to urban school reform. Drawing on the systemic school reform initiative that was launched in San Diego in the 1990s, this book explores all layers of the school reform process - from leadership in the central office, to work with principals and teachers, to the impact on how teachers worked with students in the classroom. 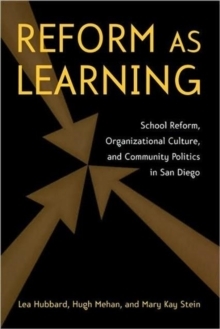 The authors draw on careful ethnographic research collected over the entire four years of the San Diego reforms, in order to identify, not only how teachers, principals and other district educators were shaped by the large-scale reforms, but also the ways in which the reform unfolded. In doing so, the book shows more broadly how actors throughout a school system can change the views of leaders and impact the larger reform process.